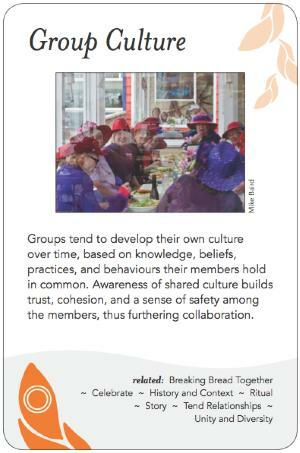 Groups tend to develop their own culture over time, based on knowledge, beliefs, practices and behaviours their members hold in common. Awareness of shared culture builds trust, cohesion, and a sense of safety among the members, thus furthering collaboration. A culture is a set of shared beliefs, attitudes, knowledge, practices, artifacts and behaviours. We are each part of many cultures, and the cultures of large organizations and societies evolve over long periods of time and may not easily change. When a group is brought together they can, at least temporarily, fuse a new group culture, drawing on parts of the cultures each individual is part of, but also leaving behind, suspending or moving beyond some of the elements of their other cultures, in the collective interest of the group. the intellectual purpose "reason" for being together. Help the group's members learn about each other. Establish the shared purpose and intention of the group and build collective energy around it. Establish the norms (behaviours etc.) expected of the group and allow those who cannot accept them to leave the group. Consider the use of common apparel or other representations of a shared culture, appropriate to the task/mission at hand. Consider the use of a shared meditation, declaration or other ritual to strengthen the bonds of the group. Be willing and prepared to challenge aspects of the culture that you think may be divisive or constraining. A group that is too homogeneous, or becomes too close, can engage in groupthink, develop blind spots, and close itself off to different possibilities. Cultures can develop into cliques or elites, closed to and suspicious and disrespectful of outsiders. See Power Shift. Be alert for those that hover at the edge (self-exclude) or are tacitly excluded from the group, and the reasons for this. Also be aware what happens to the group culture when it breaks into subgroups (especially if the sub-groups are self-selected, in which case they may create sub-cultures). Children coming into a Waldorf school where the teaching norms are typically different from the outside culture. The parents are invited, to get them on the same page by understanding how learning unfolds in the classroom through play.